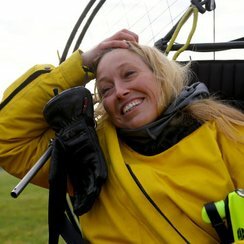 The first person to fly over the channel using just a parachute strapped to a motor this morning due to complete challenge this morning. Sacha Dench is highlighting the journey swans make when migrating as she set off three months ago from Russia. Sacha spotted over the White Cliffs of Dover before land at a Gliding club near St Margarets Bay on Monday. The next leg of her trip is to fly to hand in petition to Downing Street calling for more wetlands for migrating wildfowl across Europe. Sacha says she is looking forward to getting home. “I have been focusing on planning and surviving each day’s flight, and haven’t let myself get homesick, but when I see the white cliffs of Dover I burst into tears – I will be glad to be home,” she said.